The project of the day was to buy rosemary, transplant it to spray painted pots, and anchor those pots with twine to my fence. 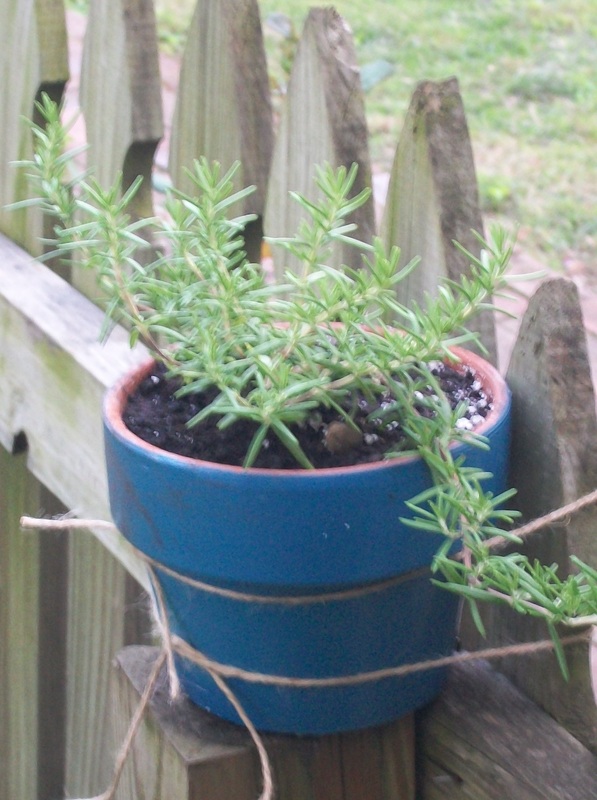 One of my mom’s co-workers swears that rosemary keeps mosquitoes away from the yard. The mosquitoes in my yard are vicious, vicious creatures that are doubly unpleasant since I’m once of those people who can be getting mosquito bites while those standing around me remain relatively unmolested. And, my body’s reaction to the attacks is nearly instant, overly dramatic swelling of the entire region of the bite accompanied by intense itching. To try to avoid this, I also planted a special variety of lemon scented geranium that is supposed to also repel mosquitoes. Right now, it just looks like a weed in a pot. I hope it gets some flowers. I did take one of the leaves off the plant and rubbed it all over my arms as suggested; I still got two mosquito bites, but a few more flew around me and didn’t bite. I’m still dubious though that this whole herbal plan will work since while I was standing right in front of one of the rosemary plants and talking to my neighbor I was still seeing mosquitoes. Maybe the plants need to get bigger and more aromatic. I hope I can keep them alive long enough for the experiment. I’m good at killing plants. In other news, I’m meeting with a real estate agent tomorrow to investigate the possibility of moving. I’ve been thinking about refinancing, so I want to make sure preparing to aggressively pay off the mortgage on this house is the best option. It feels like part of that decision should be seeing what else is out there. I’d have to pay loan fees to refinance or buy another place — hence the investigations. I’m so torn. The house I’m in now definitely feels like home after I’ve put so much work into it. I’m only a few projects away from being done with the cosmetic make-up issues that came with the house. But, at the same time, the house was built in the 1920s, which does make it a little more unique in its maintenance needs than something that is newer construction. It’s funny because the things that drive me crazy like the older windows and trim that took forever and a day to paint are some of the character building features that I’ll also miss the most if I move into new construction. It will take quite a bit in another house to lure me away from this one, but I’m meeting with the realtor tomorrow to see what he can turn up. I thought I had found a place with all the necessary perks to lure me away – fenced in yard, open floor plan between kitchen and dining room, central AC — but when I called my realtor, he informed me that it had already sold. Thanks for giving me false hope, Trulia. Yesterday, I spent several hours looking through pages and pages of about 1,500 listings, and I came up with a short list of 10 potential properties. I’m going to pull them up quickly again tonight, and I have a feeling the list will get even shorter once I take a second look at a few of them. And, I’m also looking at possible PhD programs. If anyone knows of a good sociology PhD that offers a blended online option, I sure would love to know about it. I’ve got the College Board book of majors, and I’m methodically (and alphabetically) working my way through every PhD program listed in the book. I’m up to Ohio, and I still have not uncovered a program with online options that reduce the need for sustained residency on campus. It’s discouraging. I’m also going to be looking at Learning Sciences PhD programs, so if anyone happens to know of a good one, let me know. So many decisions. They make my head hurt. Ok, I have to go pull up the real estate listings so I’m ready for my 2:00 appointment tomorrow.